CONGRATULATIONS TO RACHEL THURMAN who won the book! I’m thankful to have the authors of Leading Women Who Wound here today to chat with them about a much-needed, crucial book. If you are interested in winning this book, please comment in the comment section. You can visit Sue and Kelley’s ministry website here. We write about issues that face women today—issues we have experienced: for example, working with men and learning to work through conflict and personal attacks. 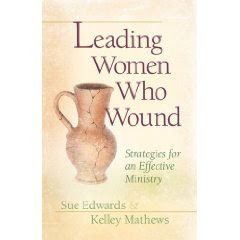 Our new book Leading Women Who Wound came out of excruciating experiences that we learned happen to many women when they work with other women. We could not find a book out there that really addressed these issues from a women’s perspective, so we wrote one. Personal attacks, difficult people, and conflict are inevitable in ministry. Whether you volunteer a few hours a week or work on full time staff, you won’t be the exception! But men and women perceive and process conflict differently. Finally, a book for women by women who have been there. Are you particularly vulnerable? Can you differentiate between constructive criticism and destructive attacks? Have you mastered the process Jesus taught his disciples? A practical comprehensive guide book, Women Who Wound and How to Lead Them will prepare you to thrive in conflict as you learn to disarm and love women who hurt you. We hope they will prepare for personal attacks and conflict, becoming more direct in their communication styles and following Matthew 18 in their personal and ministry lives. Peacemaker ministry says there are 19,000 conflicts in churches every year and one in four ministers will either be fired or asked to leave their positions. Our goal is to lessen those stats as well as the heartache that results from managing conflict badly.